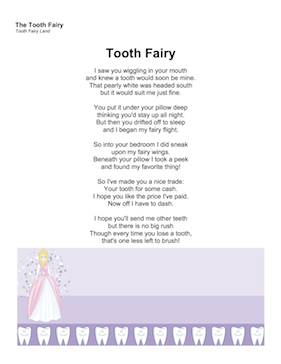 Instead of a letter, what about a nice poem from the Tooth Fairy? Waking up to this under his/her pillow will make your child proud, and keep that belief in the Tooth Fairy going for at least a little while longer. and knew a tooth would soon be mine. but it would suit me just fine. thinking you'd stay up all night. and I began my fairy flight. and found my favorite thing! Your tooth for some cash. I hope you like the price I've paid. Now off I have to dash. that's one less left to brush!